This post is for VIC residents that are switching to Powershop and want to understand when their Powershop account will be up and running. After you sign up, you have a couple of weeks to cool off (officially ten business days) to make sure you are happy to switch to Powershop. Once that’s over, everything starts to happen! The majority of Victorian homes have a smart meter, so pretty quickly your old retailer will send you a bill based on a final meter read and the meter read will be directed to us. Once we have that meter read, there is a little bit of boring industry stuff that needs to happen before we can make your account active. This whole process normally takes five to ten business days. 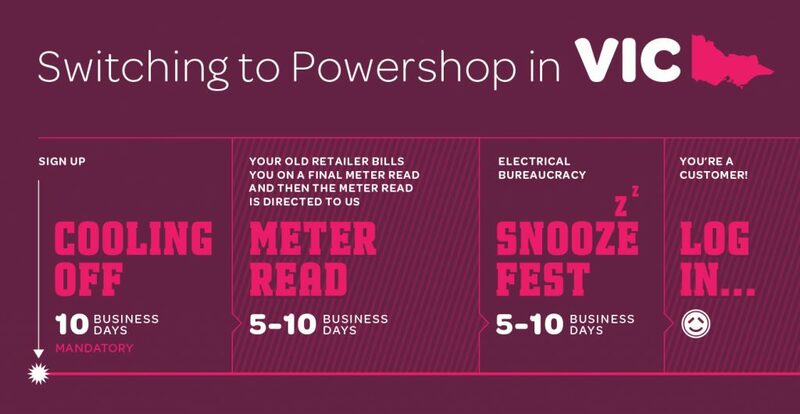 All up, it could take up to four weeks to become a Powershop customer. You’ll receive an email from us once your account is up and running so that you can get rolling with your Powershop experience.